Someone needs to sit and have a talk with this guy. This picture was not photoshopped. 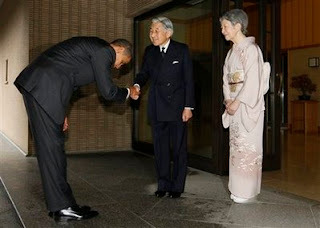 Barack Obama bowing to the Emperor of Japan. Someone needs to tell him, "Dude ! You're the President of the US. True the dollar may be going down the toilet, but you're still President of a country with 300 million people. Lichtenstein has a prince. Are you going to bow down to him? Elvis was the King. Do you bow down to Nashville? What about Burger King? Please! This is the second time you did that. Remember the King of Saudi Arabia. Here's the picture. Did you drop a contact lens? This is getting really bad! I heard they were going to give you a back brace when you were going to a summit, but they were afraid you would end up prostrating yourself on the carpet to the Prime Minister of Iceland. And while we're at it. That bumper sticker that says "I can't be overdrawn! I still have checks!" does NOT belong on the presidential limo. So don't even think about it. The last time you bowed was to the King of Saudi Arabia. And we have the picture to prove it!. What ever happened to an assertive President that would avenge America's honour? Like George Bush Senior when he threw up on the Japanese Prime Minister. Sure it was a little tacky. Saturday Night Live had a field day with it. But with all those Japanese cars making traffic jams around Washington D.C, at least someone had the guts (or something) to say "This is for Pearl Harbor. Take it to your dry cleaner!" So if you really want to make a scene and be a stand up guy like George Bush Senior (George II), then remember the following saying that I heard back in high school. "Beer and whiskey, pretty risky.... So if you want to do a gastric kamikaze attack on an annoying prime minister, chug down a few Tsing Tao beers before you sit down next to Hu Jintao, China's big honcho. Then belt back a couple of whiskeys when they seat you next to him. You should be spewin' grits around the time they're wrapping up the duck soup with all those weird vegetables in it. China was on our side in World War Two, but they were a pain in the neck ever since. So after you're finished calling for Earl in the Prime Minister's lap, just say "Here's payback for all those cheap @$$ radios that bust after a week and a half!" The following is a video of George Bush Senior barfing on the Japanese Prime Minister back in 1992. Here is the link to that memorable news event. The China that the U.S. was allied with in World War Two was Chiang Kai Check's Nationalist China. Mao Tse Tung's Communists defeated Chiang and forced him to retreat to Taiwan. In 1949, Mao declared the "People's Republic of China," a Communist country. We were never Communist China's ally. Red China supported North Korea against us as well as North Vietnam--both Communist countries. Support Sarah in 2012. Custom Accessories Garters offers a Keepsake 'Moose' or 'Polar Bear' Garter with 2012 Imprinted on Ribbon Tails. RWB Hockey Garter with Charm.